Father’s Day is almost here, and you know what that means! Come Sunday, it’s gonna be all about the daddios of the world—the amazing men who fed us, clothed us and put roofs over our heads all those years. Or maybe they still do all those things for you, if you’re lucky! The least we can do for these standout guys is to show our love and appreciation on this one day out of the entire year. And there’s no better way to do that than by giving the main man (or men) in your life some spankin’ new eyewear! We’ve handpicked a bunch of specs ‘n sunnies for all kinds of dads. 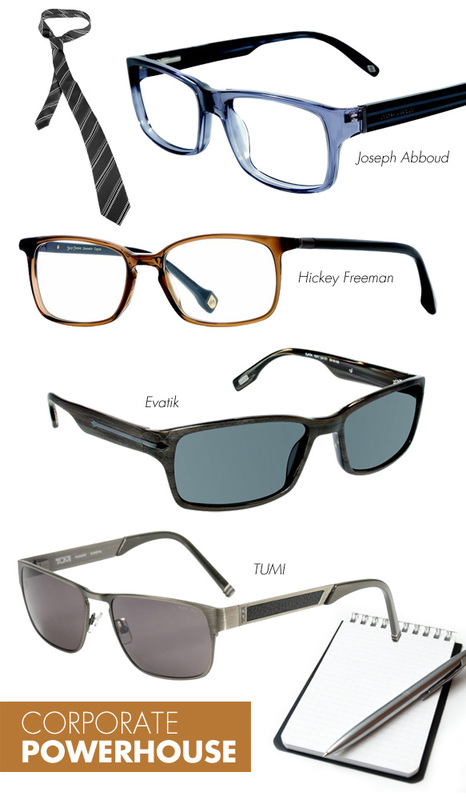 Take a look-see, and you’re sure to find a pair of frames fit for your fave guy! Does your pops spend every waking moment caught up in some sort of adrenaline-pumping activity with his buddies? 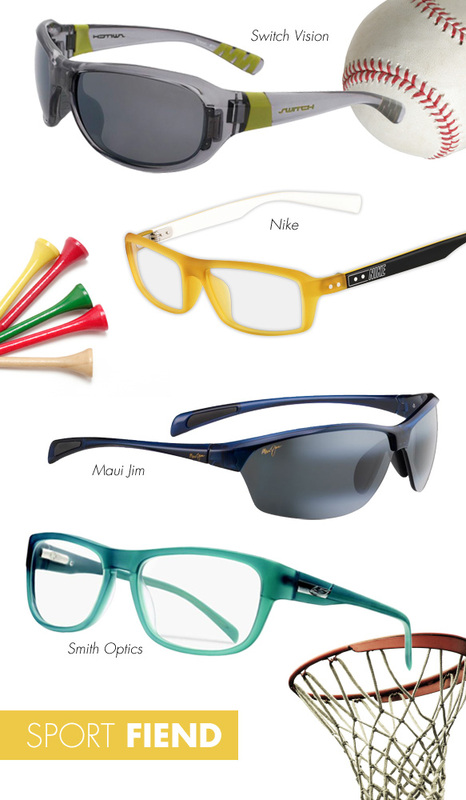 If so, then you ought to get your sports-obsessed dad some equally athletic eyewear! Comfort is a must for active guys, and they might as well look stylish while they’re workin’ up a sweat. So opt for wraparounds or simple rectangular silhouettes with snug, rubberized temples in bright colors like green, turquoise and yellow for extra oomph. If you barely see your dad wearing anything but fitted suits, dapper ties and shiny loafers, and if he hangs in his office more than his own home, then you’ve got quite the executive on your hands! Help him finish off his look by snagging him just the right specs or shades that’ll make his business attire look that much more polished. Go for understated profiles to maintain a professional vibe, with faux wood and metallic finishes, or hints of translucent browns and blues, for added style. If your old man is always dressed to impress and flipping through GQ‘s fashion spreads, our guess is that he’s never caught in his college sweats. Ever. 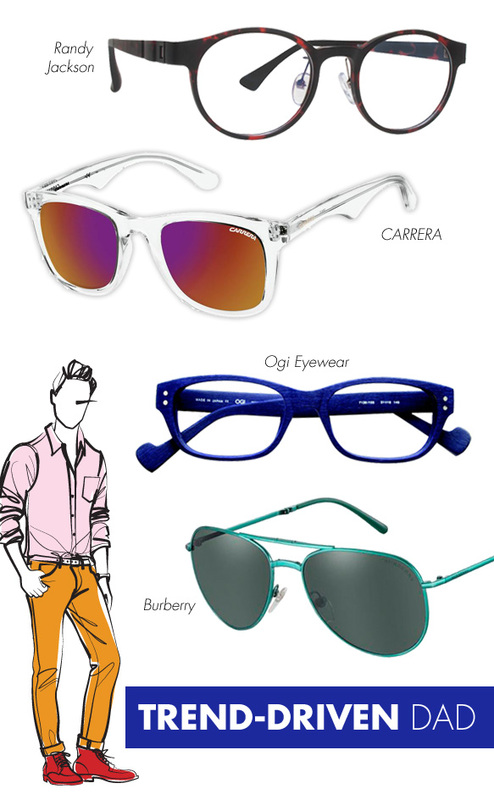 Keep dad’s passion for fashion going strong in a pair (or two) of runway-worthy eyewear. Crystal effects, colored lenses, metallic finishes, and vibrant blue and emerald hues are sure to be his thing—after all, they’re trending this season! Your house is practically overflowing with whatever books, magazines and newspapers your dad can get his hands on! Plus, he just bought a fancy e-reader. But don’t let him squint over that teeny tiny font anymore. 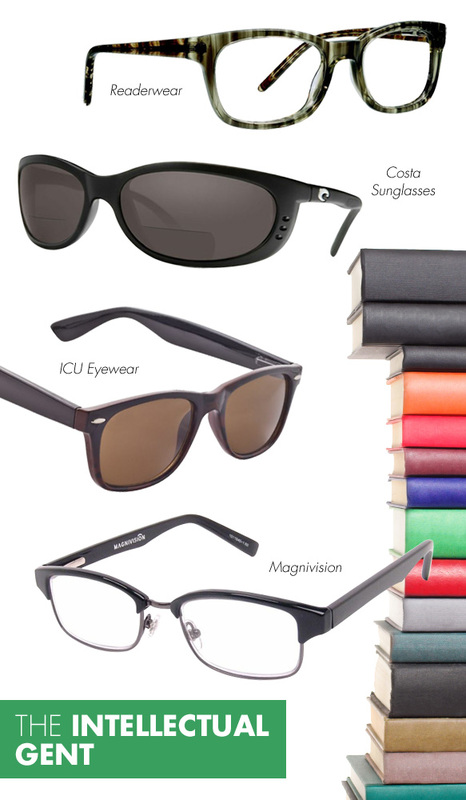 A new pair of reading glasses, or sun readers if he enjoys the outdoors, will do just the trick. So before he delves into his next novel, show him that readers can be cool, and practical, with any of these refined frames. Whether it’s camping, hunting, hiking or fishing, you name it, your dad digs it. Satisfy his craving for all things rugged—and ensure he can see clearly and his peepers are safe from the elements—with eyewear fit for all his rough and tough pursuits. 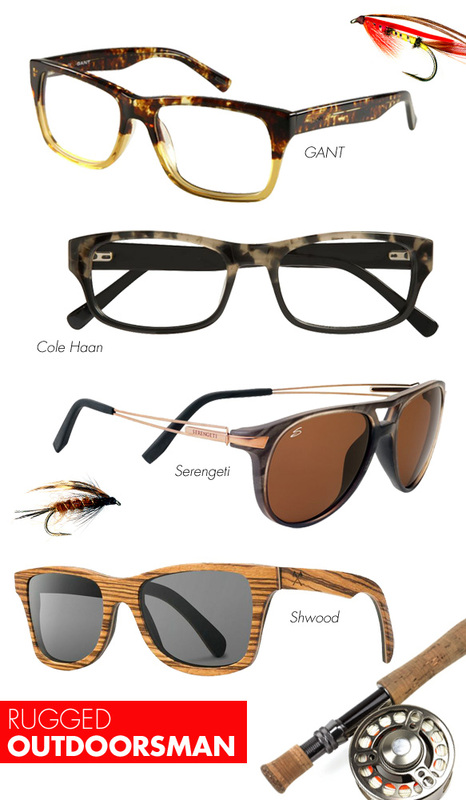 Masculine shapes like modernized aviators and wayfarers are perfect for your outdoorsman, not to mention true-wood materials, two-toned colorations, a darkened color palette and UV-protected lenses.